The City of Greenback acquired an historic property in the old downtown area in 2004. 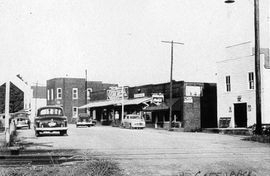 The building situated between the old McCall Hardware and the Drugstore Diner had been home to several grocery stores under a number of proprietors over the years. Greenback Mayor, Tom Peeler, proposed that a community museum might be a good use for the site and the suggestion was greeted with enthusiasm by community residents. Mayor Peeler and the Greenback City Council coordinated the remodeling of the building during the next year. Peeler also appointed a Museum Committee of volunteers to plan and oversee operation of the facility. After remodeling was complete, a staff of volunteers began accepting donated items for display. The Greenback Heritage Museum opened in March 2006 and has operated continuously since that time. The museum is operated completely by local volunteers. It is managed by a Museum Committee of six individuals led by a Chairperson, a Treasurer and a Secretary. Funding for upkeep of the site, utilities and telephone is provided by the City of Greenback. Operating supplies and materials are provided by donations from patrons and residents. There is no admission fee for visitors. Come visit us and see our local history come alive.